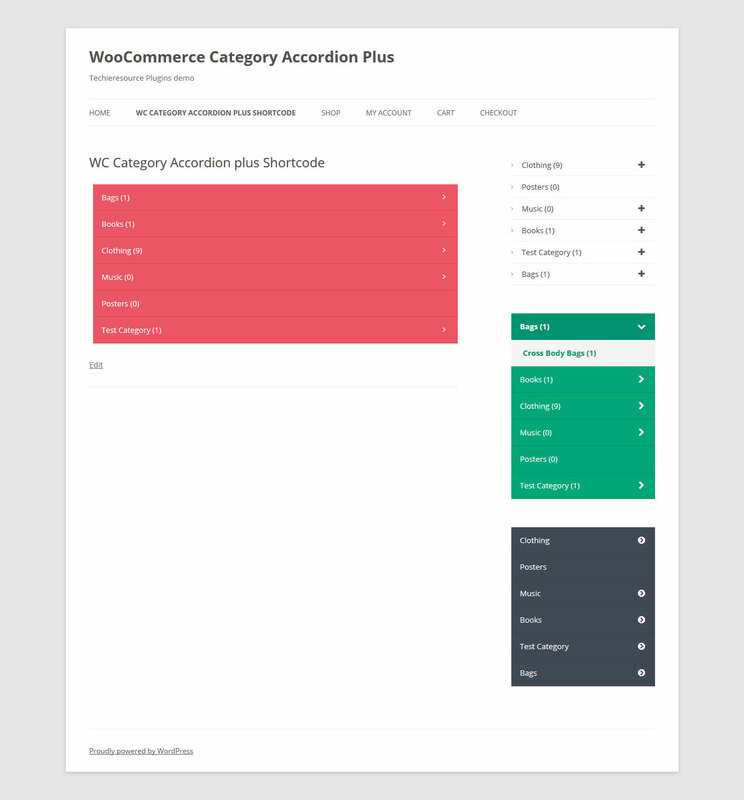 WooCommerce Category Accordion plus will make an efficient list of the categories of your products and improve the user experience of your WooCommerce shop. WooCommerce Category Accordion Plus plugin allows you to list wooCommerce product categories and subcategories into a toggle accordion with expand /collapse option. You can you this plugin as a widget or shortcode, This plugin highlight the current product parent category and subcategory. 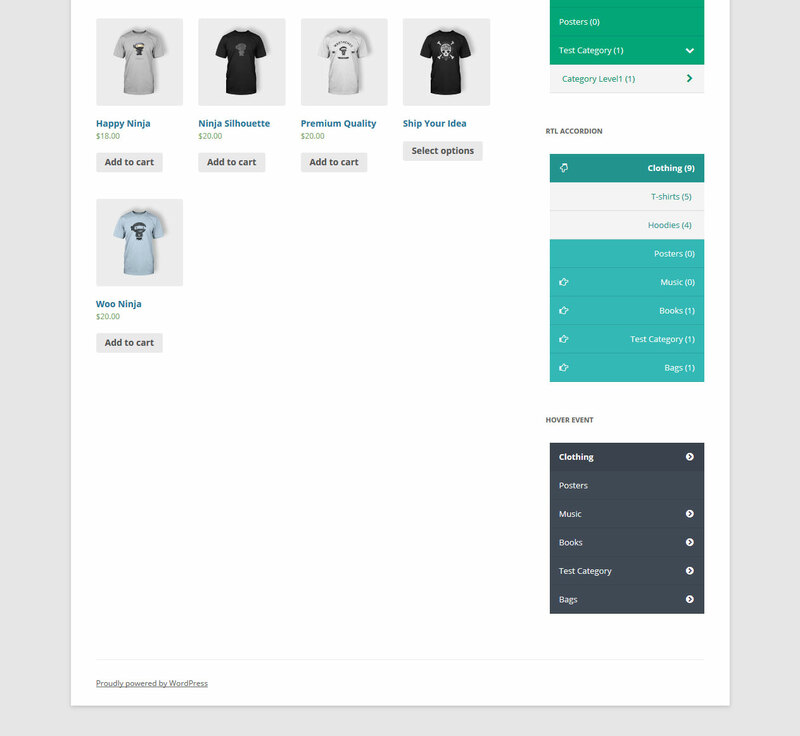 This plugin provides easy navigation to your wooCommerce powered shop products and categories. Support Toggle and collapsed options. Support Click and Hover Event types. Highlight or Open a Category by Default. Widget Ready and Shortcode Option. Enable / Disable products count. Show / Hide Empty Categories option. Categories sort by and order option. 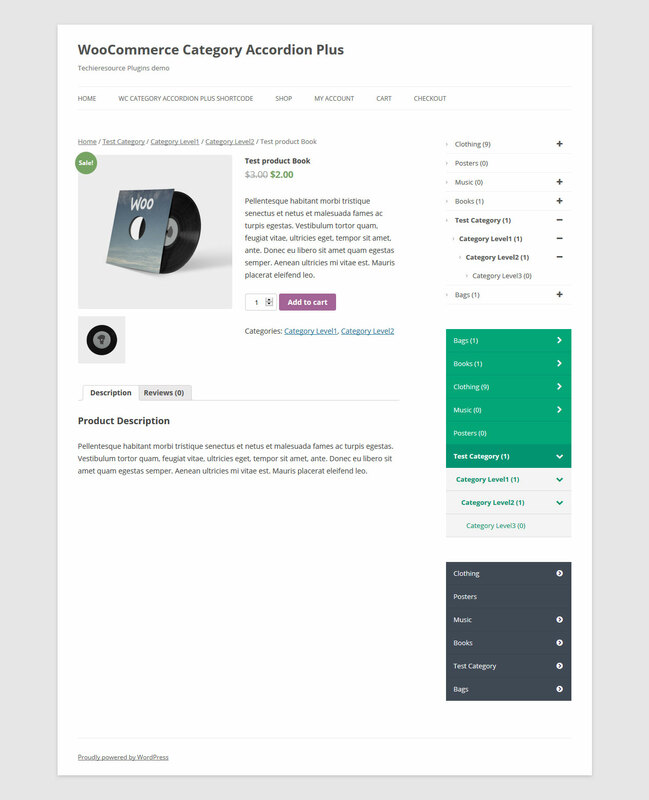 Woocommerce category accordion Plus plugin is a simple solution for your woocommerce store Category Navigation, which allows you to list the categories into a accordion. 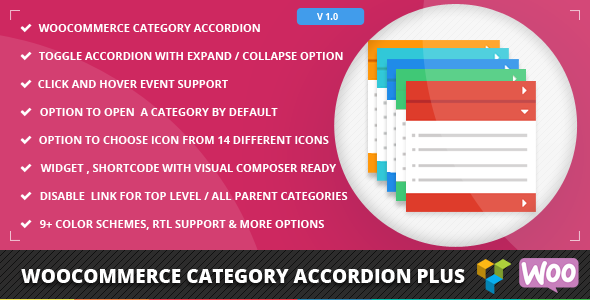 Woocommerce category accordion Plus plugin comes with Visual Composer support you can get all the benefits of category accordion functions inside the visual composer. woocommerce category accordion plugins is a simple , fully Customizable and easy to use category accordion plugin for woocommerce. Woocommerce category accordion Plus plugin comes with 9+ predefined color schemes, you can use any of the skin that match with your theme. Woocommerce category accordion Plus plugin Support both Click and Hover Events for Navigation. Woocommerce category accordion Plus plugin support both Toggle or Continuous collapsed option. Woocommerce category accordion Plus plugin have the option to disable link for parent category and all parent category links. 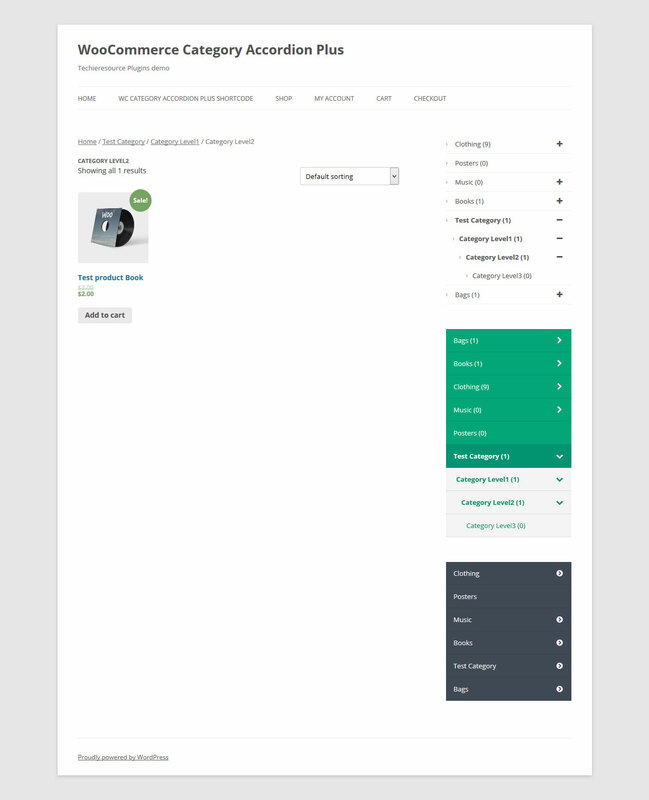 Woocommerce category accordion Plus plugin have the option to turn on or off highlight current . category and also have the option to open a category by default. You can use our plugin as a widget or Short code , with Easy visual shortcode function you can easily add or modify category accordion function anywhere on your post or page. 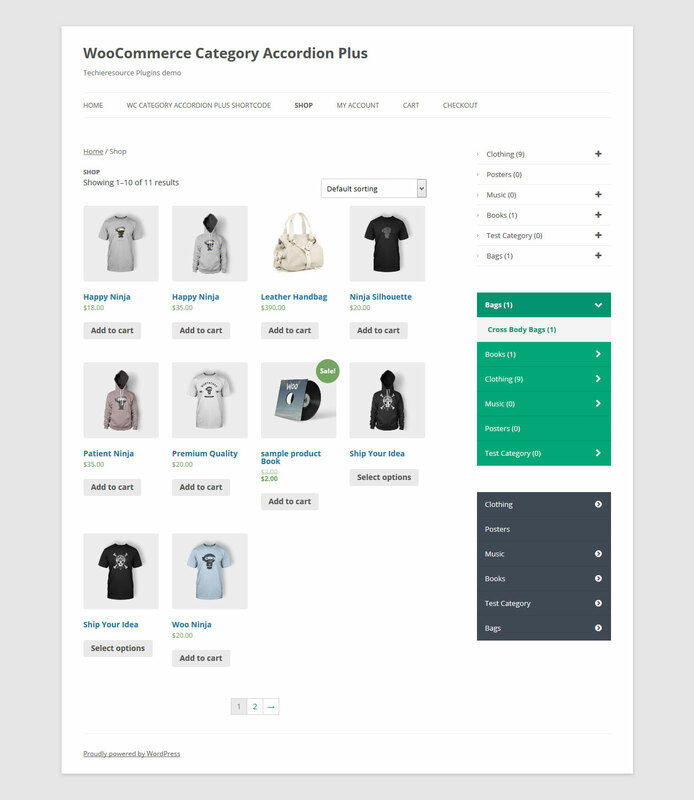 Woocommerce category accordion Plus plugin uses Fontawesome icons for navigation you can select your icons from 14 set of different icons. Woocommerce category accordion Plus plugin perfectly works with all major browsers including Firefox, chrome, opera, safari, Edge, IE. Woocommerce category accordion Plus plugin support multiple instances it will work on same page with multiple widgets or shortcodes with different configuration. Woocommerce category accordion Plus plugin support’s Right to Left (RTL) text direction. you can enable this option through settings. Our plugin perfectly works with wordpress Multisite and easily translate to other languages. Our plugin provides the perfect Category Sidebar Navigation with easy to use setting process that will helps you to save your costly time. Great plugin looking good on my shop, especially the classic skin is very nice. If you need any help, please feel free to contact us. This code is great and it does what I need. I had a question and submitted a support ticket, I got reply in less than 10 minutes with perfect solution. Thank you for the great product and support.